Visit our hotel in Salinas, California, the Best Western Plus Salinas Valley Inn & Suites, to enjoy a comfortable stay near top activities and attractions. You'll enjoy every minute of your visit to our Salinas hotel, thanks to our array of amenities, starting with the outdoor heated pool and spa. Don't forget to enjoy our free, full breakfast, which includes hot eggs, meat, pastries, coffee and more. With free high-speed wireless Internet and a business center that offers copy, fax and computer services, you'll have everything you need to stay connected on your journey. Located off of Highway 101, our central California hotel has 17 suites for extra space and comfort, some of which features its own hot tub and others featuring two separate rooms. All guest rooms boast cable TV with HBO , microwaves, mini refrigerators and desk areas. You'll find no shortage of things to do and see near our hotel in the Monterey Bay area, including the popular Salinas Rodeo and the Salinas Pro National Motorcycle Races at the nearby Salinas Sports Complex. We're located very close to Historic Downtown Salinas, the Steinbeck Center, Monterey Bay Aquarium and the famous Laguna Seca Raceway, so you can enjoy a wide variety of activities. Don't forget to check out the California International Air show at the Salinas Municipal Airport or the many car shows and races nearby. Then, of course, there are the beaches of Monterey Peninsula which offer the perfect place to relax and catch some sun by the cool Pacific Ocean. Those traveling for business will enjoy our Salinas hotel's close proximity to government offices, courthouses, agricultural companies and healthcare providers. We also offer meeting and conference facilities for those who need it. 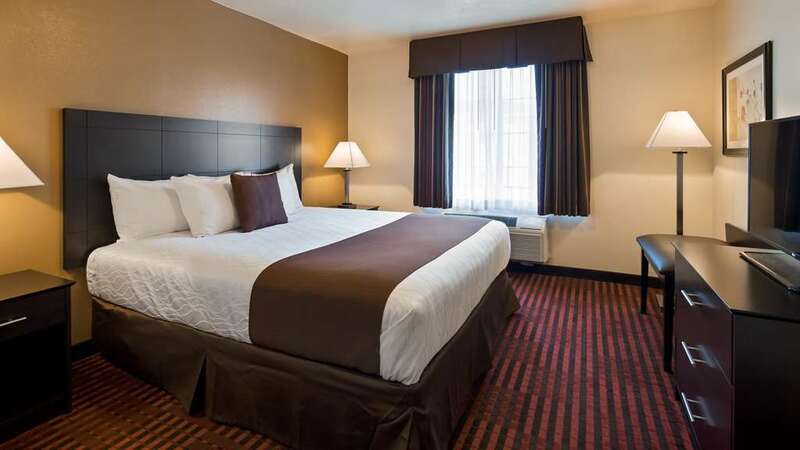 Book your stay at the Best Western Plus Salinas Valley Inn & Suites today, to experience all that the beautiful central California coast has to offer near our Salinas hotel! Enjoy your stay. From: The south. Take 101 North and exit on Market Street, then make a left on Kern. The Best Western Plus Salinas Valley Inn & Suites is on the left-hand side at the end of the street. From: The north. Take 101 south and exit Market Street, then go left on Market St and left turn on Kern St. The Best Western Plus Salinas Valley Inn & Suites is on the left-hand side at the end of the street.